"I got this recipe from my favorite health food store. It is wonderful!!" Place apples in a pie pan and dust with cinnamon and nutmeg. Cover with foil and bake for 20 minutes. In a food processor chop nuts with a few short pulses. Pour in sugar and flour and process to combine. Add butter and salt and process until mixture resembles coarse meal. Sprinkle topping over apples. I love apple crisp... can't get enough. 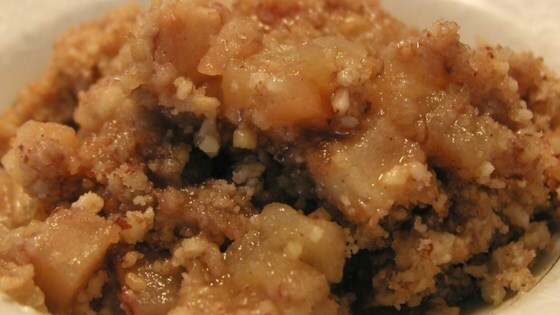 This is the BEST apple crisp I've ever had! Simple & delish! Very good! But where's the oatmeal I usually see in the apple crisps topping? I like the crumb topping. Next time I'll add more apples though. Overall, a good recipe. This was very good, but next time I may cut back on the butter. It ended up making the topping a little greasy.